Some of the best fishing you’ll experience occurs during the chilly fall months when lots of other anglers store their gear in preparation for winter. As fish begin to fill their bellies to prepare for the winter months, activity on the water kicks into high gear. Fall is especially productive for fly fishermen, who can bring in tons of trout while the leaves are changing. 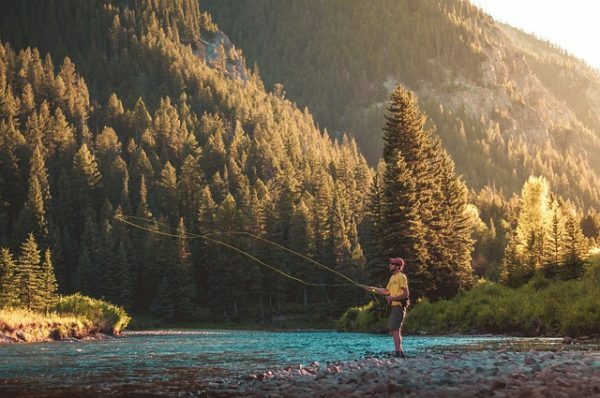 Here are five tips to help you start your fall fly fishing on the right foot. During warmer seasons, the best action tends to occur early in the morning or late in the evening, but during the fall months it pays to sleep in a little before loading your fly gear. This is because trout aren’t as active early in the morning during the fall, as they’ll be waiting for the water temperature to warm up a bit before they feed. Keep in mind, too, that this also means they’ll wrap up their activity earlier in the evening, as well. As the days shorten, the sun will start to cause shadows to stretch farther. Keep this in mind as you approach the shoreline, as shadows and a large profile can spook the fish. While wading, crouch or kneel on the bank if possible and cast from farther away. The key is keeping a healthy distance between you and the fish, along with maintaining a low profile. Because the rivers tend to be crystal clear and lower this time of year, you’ll find that the fish can spook easily. To compensate for this, it’s wise to use longer, thinner leaders on your fly line, like in the 10 to 12-foot range. Yes, this will make it a little harder to cast, but you’ll be thankful you went with the longer leader when you’re drawing more strikes. Trout will be packing away the pounds in preparation for winter, which means they’ll be aggressive and on the hunt for big meals. With this in mind, you’ll want to make sure you have plenty of streamers on-hand. Make sure you’ve got a few with orange in the material and don’t be afraid to go big if big fish are what you’re after. While streamers will be your fly of choice, it’s smart to keep a few insect-mimicking flies handy, as well. Insects like ants, beetles and grasshoppers are a main item on any trout’s diet, especially during the fall, when these protein-packed bugs offer ideal nutrients for trout. Insect flies are great for probing the shoreline and when fish are rising to the surface to feed.